Enjoy original art, photography, design, articles, poetry, and more! Vol. 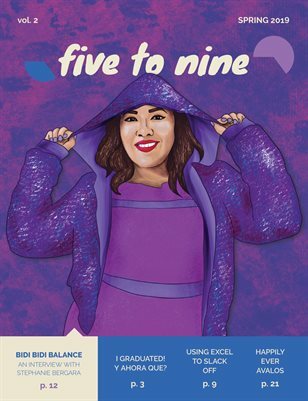 2 of five to nine magazine has an inspirational cover story, discussion of grad school, art in various unique styles, and continuations of some favorites from vol. 1. Find updates and additional content at fivetoninemag.com! Five to nine magazine is a zine and website where regular people can share creative work and endeavors, as well as comment open and honestly about the realities of adulthood, like trying new hobbies, reflecting on career paths, pursuing higher education, or discussing mental health, along with countless other things. Creative work is a great way to make some sense of life, and this is a judgment-free place where it can be shared with others who are probably going through all the same things.